As has already been noted on these pages, the BBC’s coverage of the end of the latest round of negotiations between Israel and the PLO which reached their pre-set deadline on April 29th was left entirely in the hands of Middle East editor Jeremy Bowen. BBC audiences did not hear, read or see any alternative opinion or analysis to that provided by Bowen and vigorously promoted on a variety of BBC platforms. In addition to Bowen’s filmed and audio reports already discussed here (see related articles below), two further items dated April 29th promoted the same themes as his previous ones. 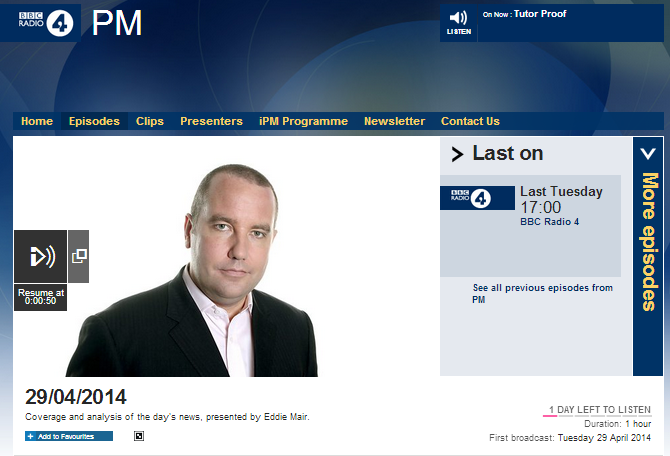 The BBC Radio 4 programme ‘PM’ broadcast an audio item by Bowen in its April 29th edition which can be heard here. Presenter Eddie Mair stayed on message in his introduction to the item, promoting the superficial notion that Israel is to blame for the demise of the talks and – notably – with the unilateral actions taken by the PA such as applying to join UN agencies in breach of the agreement reached before the talks’ commencement or the Hamas-Fatah unity deal already having been erased from the BBC version of events. In this item, Bowen yet again reports from Hebron and once again fails to inform audiences that Israelis living there do so because the Palestinian Authority agreed to their presence in the H2 area of the city by signing the Hebron Protocol in 1997. Bowen also once again refrains from informing listeners why he needs to use the word “restarted” in the following sentence. Bowen fails to inform listeners that security arrangements in Hebron – including those near the shared site of the Cave of the Patriarchs – are laid out in the mutually agreed Hebron Protocol, preferring to imply instead that freedom of worship for Muslims is impaired by Israeli security measures. Bowen continues by interviewing an unidentified man in the street, whose opinions he apparently considers worthy of amplification, but providing no context – for example in relation to the subject of why exactly the “prisoners” the man mentions are imprisoned. Bowen then goes on to promote the NGO ‘Combatants for Peace’, describing the members he interviews only as ‘peace campaigners’. That leads to Bowen’s conclusion, in which he promotes the notion of “the expansion of Jewish settlements” as being on a par with terrorism. 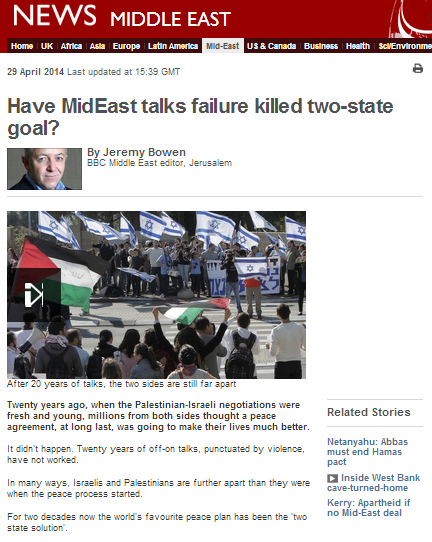 Bowen’s two interviewees from ‘Combatants for Peace’ also appeared in his written report which was published in the ‘Features & Analysis’ section of the BBC News website’s Middle East page on April 29th under the title “Have MidEast talks failure killed two-state goal?“. In that article Bowen repeats and promotes the same messaging points which dominated his other filmed and audio reports. As he did just days before in another report, Bowen once more ‘tidies up’ Palestinian terrorism against Israeli civilians in this one too, euphemistically turning it into unattributed and amorphous “violence”. “Twenty years ago, when the Palestinian-Israeli negotiations were fresh and young, millions from both sides thought a peace agreement, at long last, was going to make their lives much better. Bowen’s explanations to BBC audiences as to why the talks have failed are equally euphemistic and notably he continues the BBC policy, evident throughout the last nine months of coverage, of failing to clarify the crucial significance of the refusal of the Palestinian Authority (with Arab League backing) to recognize Israel as the Jewish state and thus an end to any future claims. “Secretary of State John Kerry has been forced to apologise, in effect, for remarks he made saying that Israel risked becoming an apartheid state if it cannot make a deal with the Palestinians. Bowen also refrains from explaining to BBC audiences why Palestinians “want it [Israel] to be compared to apartheid South Africa”, even though the comparison is utterly redundant. He fails to clarify that this is a tactic employed by Israel’s delegitimisers in an attempt to stigmatise the Jewish state as being morally beyond the pale and hence to bring about the demise of that country in its current form. There is nothing new about the BBC’s consistent refusal to explain to its audiences the roots and political intentions of the ‘apartheid’ trope, but the fact that its Middle East editor – the man whose entire role is supposed to be to provide context to audiences – continues to intentionally avoid presenting that crucial background information on the one hand, whilst amplifying that trope on the other, raises serious doubts about his commitment to BBC editorial guidelines on impartiality and his ability to fulfil his stated role. What is the BBC’s take away message on end of Israel-PLO negotiations? “I’m in Hebron which is the only city on the West Bank where Jewish settlers – Israelis – live in the heart of the town alongside Palestinians” – but the BBC considers “East Jerusalem” to be occupied area, a part of the “West Bank”? And there are multiple Jews living there side by side with Arabs, so Hebron is not the only such city, or is it? Apparently, the definition of what is and what’s not “West Bank” changes depending on the angle of the story being promoted by the BBC at that moment. It is easy Michael: Israeli settlements in the State of Palestine – West Bank, including East Jerusalem, and Gaza are a violation of international humanitarian law and illegal. And your response has nothing to do with my comment, so its easy – regardless of what is being said, your response is “Israel=evil”. Rather than a “trope” it’s pure tripe! Meanwhile, in other bad BBC news today, Lord Patten is stepping down as BBC Trust chairman after heart surgery. Furthermore BBC singer and entertainer 83 year-old Rolf Harris appeared in court today to face 12 counts of indecent assault on girls between 7 and 19. Rolf had a string of hit recordings in the sixties and seventies, most famously “Two Little Boys” and “Tie Me Kangaroo Down Sport.”. NB. Today’s “Telegraph” newspaper shows that Lord Patten has not gone without a plea to the Prime Minister to save the BBC. Judging by the number of vitriolic comments under the article, Telegraph readers agree with Duvidl that the corrupt BBC should be privatised as soon as possible.